Pacific X-treme Combat (PXC), the Asia-Pacific’s top MMA organization, returns to Guam for another huge MMA showcase of talent from the US Territory, featuring fighters from Guam, Hawaii, California, Korea, and Japan in a night of professional MMA competition. Recently crowned PXC Bantamweight Champ, Michinori Tanaka of Japan, will defend his Title for the first time in hostile territory against rising MMA star from Guam, Kyle Aguon, on October 25th at the University of Guam Field House in Mangilao, Guam. Aguon earned the right to challenge Tanaka for the belt by defeating Hawaii’s Russel Doane at PXC-38 in August in a tight decision, bringing Aguon’s current winning streak to 4 straight. At 24 years old, Aguon has used his sizable frame, reach and strong grappling to establish himself as the top contender at 135 pounds. Michinori Tanaka, on the other hand, does not intend on giving up his belt t yet. 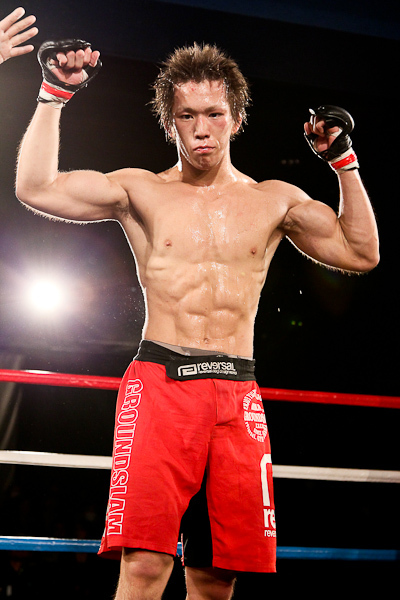 At 23 years old, Tanaka is one of Japan’s top young fighters with an undefeated record of 8 – 0, including impressive performances against Russel Doane, Caleb Vallaton, and former Champ, Crisanto Pitpitunge. Tanaka (5’5”, 135 lbs) captured the Titel at PXC-36 with a unanimous decision win over former Filipino champion Crisanto Pitpitunge in Manila. This will be his second fight on Guam in his pro career, his first five victories coming in Japan’s Shooto fighting organization. Tanaka versus Aguon is expected to showcase world-class grappling and submissions attempts, although both fighters throw heavy punches and possess knock-out abilities. 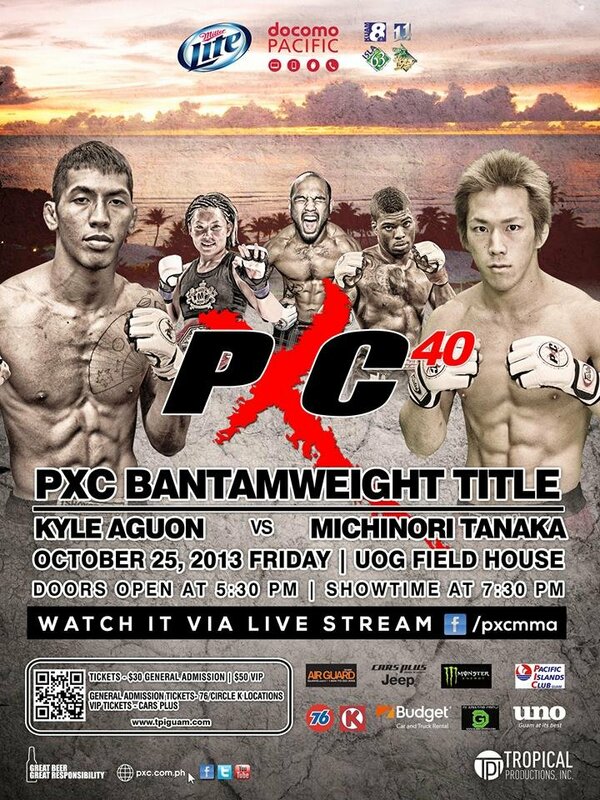 This main-event will also be the first PXC title fight in Guam in over a year. Pacific X-treme Combat (PXC) wrapped up its 37th installment on Saturday (May 18, 2012), at the Ynares Sports Arena, Pasig City, Philippines. Crisanto Pitpitunge failed to defend his title as he was defeated by the skillful Japanese fighter, Michinori Tanaka via Unanimous Decision. It was a very entertaining fight between Tanaka and Pitpitunge as two of the best bantamweights in Asia gave all they got to entertain the fans. In the first round, everyone thought that Crisanto will make Tanaka tap as he caught the Japanese submission specialist into a tight rear-naked choke. But Tanaka looked very relaxed while Pitpitunge’s squeezing his neck – that’s how high level grappler Tanaka is. Since that RNC attempt by the former champ, it was all about Tanaka’s wrestling. Tanaka and his team were very emotional after the fight as they all knew that their labor paid off as they’ll bring the PXC bantamweight belt back home in Japan. In this sport of MMA, each bout can only have one winner and one loser. Getting a victory in this tough sport is no doubt, one of the best thing that has happened to a fighter while losing can put a fighter down emotionally and mentally. We know the fact that all fighters are looking for that win; we must also know that some captures it, others don’t. After enduring some rigorous training and exhausting weight cut, Korean Top Team’s Jang Yong Kim is back to his winning ways as he submitted an up and coming fighter from Hawaii, Nate Thorell in the opening round via kimura. While Kim is celebrating his win against Thorell, his team mate, Hong Seung Chan was at the dugout thinking what went wrong in his game plan as he was defeated by Reno Remigio of Hawaii in the third round by way of TKO (punches). Remigio’s Muay Thai played a big factor on his victory over the South Korean fighter. He is connecting solid knees and razor sharp elbows whenever they are in the clinch position. Also, the take down defense of Remegio helped him get the W for his PXC debut. Though stepping up late to fight Chan, the part Hawaiian-Filipino Remegio showcased his superb striking abilities and left a message to the rest of the lightweight division that he is here to stay. Fight Works MMA went 2-0 as Rolando Gabriel Dy submits Arex Montalban by way of armbar and Ernesto Montilla Jr. shocked the crowd by taking out Team Lakay’s Jerome Wanawan in the second round. The Laguna-based fight team is going to celebrate its first anniversary on May 27th and getting big wins last night were an early gift for the whole team who struggled to get some sponsorship prior to PXC 37. Someone really needs to support this team financially because the talents over there are exceptional. I predict that FWMMA will be one of the Philippines’ best MMA team in a couple of years. While Fight Works MMA celebrates their huge victories last night, Team Lakay arguably had their toughest outing so far as they went 0-3. Wanawan faced a much improved Ernesto Montilla last night. Montilla showed speed, power and his excellent endurance. Montilla handed Jerome his second straight losses. Troy Bantiag faced Trevin Jones in a match where most of the fight fans knew he will dominate. But Jones fought smart and took the fight to where Bantiag has his weakness – on the ground. Jones defeated Bantiag via UD. Team Lakay vows to bounce back strong on August 31st as 5 of its best fighters will fight in ONE FC 9 ‘Rise to Power’. Here’s The Full Fight Card For PXC 37! PXC officials just released their final bout for their 37th installment on May 18th, at the Ynares Sports, Arena, Pasig City, Philippines. Though the Mark Striegl vs. Yusuke Yachi bout has been scratched due to Striegl sustained a minor injury during training, PXC 37 is still going to show you a lot of very exciting and interesting fights as the main event between Crisanto Pitpitunge and Michinori Tanaka will push through. The first Singaporean PXC fighter and one of the youngest fighters in the PXC today, Syafiq “The Slasher” Abdul Bin Samad battles a tough Brazilian Fighter/Model, Wesley Machado. Also, Nate Thorell versus Korean Top Team’s Jang Yong Kim will try to knock each other out to advance into the next round of the four-man featherweight tourey. Also, former URCC featherweight champion Ricardo Sapno will make his PXC debut against a very tough Japanese opponent in Takumi Nakayama. PXC officials confirmed through its official Facebook page that Mark Striegl versus Yusuke Yachi will be moved on their August card in the Philippines, with Ale Cali defending his belt against Louis Smolka. So fans will still see that much-anticipated match up between Striegl and Yachi, plus, Ale Cali defends his title when he battles super talented Hawaiian, Smolka. Visit PXC.COM.PH for more details. A World Title Fight and a Four-Man Featherweight Tourney Is Set For PXC 37 On May 18th! PXC 37 is going to show you MMA at its best! PXC 37 will showcase gigantic match-ups including a world title fight and a 4-man tournament for the PXC Featherweight Title as Crisanto Pitpitunge will defend his world bantamweight title against the surging Michinori Tanaka, while Mark Striegl, Jang Young Kim, Yusuke Yachi and Nate Thorell will battle it out to become the PXC featherweight champion. Filipino world bantamweight champ will defend his world title as Team Lakay’s Crisanto “The Slugger” Pitpitunge (4-1) battles undefeated Japanese fighter Michinori Tanaka (7-0). Pitpitunge’s last fight shocked a lot of people as he put Justin Cruz to sleep in a single punch to his chin; everyone went nuts as PXC crowned its new bantamweight champion in Pitpitunge. Tanaka is known for his very tricky ground game. 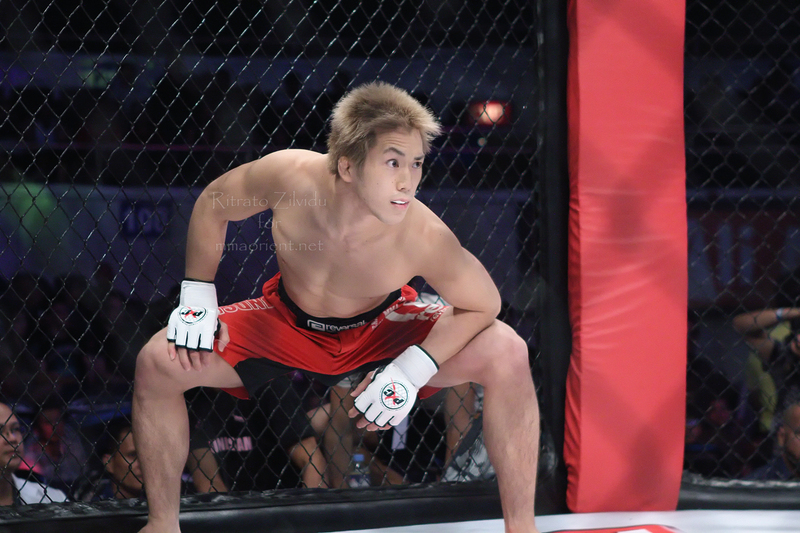 The 22-year-old Japanese fighter is arguably the best grappler in the PXC and one of the youngest fighters to ever compete in the guam-based MMA organization. While the champ, Crisanto Pitpitunge is a KO artist who loves to stand and bang with his opponents – that’s why he is called “The Slugger”. It is another classic striker versus grappler match-up and a highly candidate to get the KO or Submission Of The Night honors. Another Filipino MMA icon is set to fight in PXC 37 as one of Asian MMA’s best featherweights, Mark “Mugen” Striegl makes his third PXC appearance and looks to stay unbeaten inside the PXC cage as he participates PXC’s four-man featherweight tournament against a Japanese featherweight champion, Yusuke Yachi. Also, another match-up for the said tourney is set between KTT’s Jang Young Kim and Hawaii’s Nate Thorell. The winner of the said tourney will be crowned as the new PXC featherweight title. The first-ever Singaporean fighter to be signed by the PXC, Syafiq “The Slasher” Abdul Bin Samad, a very well-rounded fighter, will make his PXC debut against the PXC vet, Glen Ranillo. There are more exciting match-ups to be announced in the coming days, so stay tuned! Japan’s Shooto champ, Yusuke Yachi (9-3), signs with one of Asia’s premier mixed martial arts (MMA) promotions, Pacific Xtreme Combat (PXC), and will make his debut on May 18th in the Philippines versus Filipino MMA star, Mark “Mugen” Striegl (12-0) at PXC 37 for the four-man World Championship Featherweight Tournament. Another matchup for the said featherweight tournament is yet to be announced in the coming weeks. Yachi is one of Japan’s rising MMA stars, who train alongside some of the best Japanese fighters with the very popular Krazy Bee dojo in Tokyo, Japan. The 22-year-old Yachi is a tactician; he likes to wear his opponent down with his style of fighting. 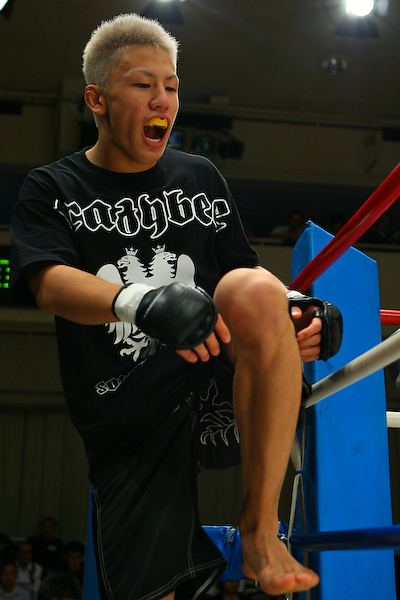 He has a notable wins over Wataru Miki and Yuji Hoshino. He is making his debut in the PXC, carrying with him his impressive 5-fight winning streak and looks to put the first loss on Striegl’s record. 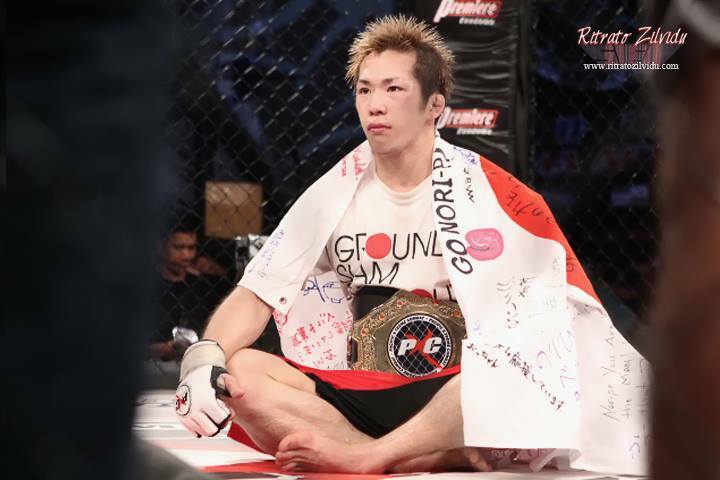 PXC 37 will also feature a world bantamweight championship bout between another young Japanese rising star, Michinori Tanaka, who will go up against the champ, Team Lakay’s Crisanto “The Slugger” Pitpitunge. Also, the always exciting PXC flyweight champion, Ale “The Young Gun” Cali defends his title for the second time against an undefeated Hawaiian fighter, Louis “Da Last Samurai” Smolka. The first-ever Singaporean fighter to sign with PXC, Syafiq “The Slasher” Abdul Bin Samad will also make his debut against a PXC veteran, Glenn Ranillo in a lightweight matchup. PXC 37 will take place on May 18, 2013 at The Ynares Sports Arena in Pasig-Manila, Philippines. The event will be broadcast nationwide on AKTV via IBC-13 to millions of viewers in the Philippines, and will stream online via PXC’s Facebook page. Visit www.pxc.com.ph or www.facebook.com/pxcmma for news and information. Two of the most dominant bantamweights in the region today collides in May 18th as Philippines’ pride and the reigning PXC bantamweight king, Crisanto “The Slugger” Pitpitunge (4-1) makes his first-ever title defense against the surging undefeated Japanese fighter, Michinori Tanaka (7-0) at PXC 37 scheduled on May 18th at the Ynares Sports Arena, Pasig City, Philippines. It has been almost a year since we last saw Pitpitunge in action – that was when he put Justin Cruz to sleep in a single blow straight to his chin during their bantamweight championship fight in July of 2012. After capturing the bantamweight belt, Pitpitunge focused himself in a six-month training as a police officer. Pitpitunge is known for his outstanding endurance and physical toughness. He has a deadly striking game and once he’s on top of you, it is the beginning of the end for you. On the flip side, Michinori Tanaka is coming off a very convincing win over Team Reign’s Caleb Vollatton by way of 2nd round submission (triangle choke) in PXC 36 on March 8, 2013. Tanaka is no doubt, one of the brightest prospects in Japan today and he is going to be a superstar in years to come. 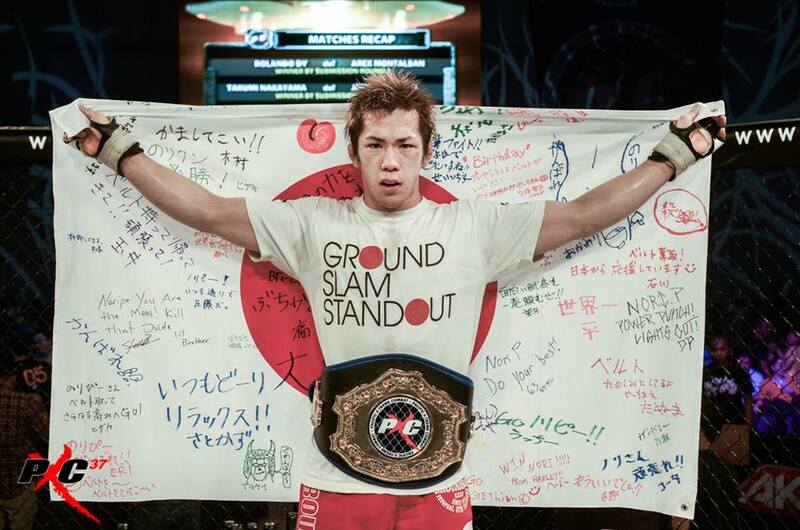 He trains at Reversal Gym Yokohama Ground Slam alongside Shinichi Kojima, Shuichiro Katsumura and Chuji Kato. Tanaka is known for his very tricky ground game. The 22-year-old Japanese fighter is arguably the best grappler in the PXC and one of the youngest fighters to ever compete in the guam-based MMA organization. He will be making the most important fight of his career against a very tough opponent in Crisanto Pitpitunge. Tanaka is one of Japan’s top rising stars of the sport and has yet to be beaten. We have so many elite bantamweights in PXC. iI will be hard for any champ in this division to hold on to the belt for too long..but anything can happen in MMA if you make a mistake against elite PXC fighters!” Calvo Added. Will Tanaka keep his streak alive or will Pitpitunge add another highlight KO win over his Japanese foe? Aside from a confirmed bout between Singapore’s Syafiq “The Slasher” Samad and Philippines’ Glen Ranillo, there are also rumors that PXC 37 will also feature a four-man featherweight tournament and a flyweight championship fight between the reigning champ Ale “The Young Gun” Cali and the super tough Hawaiian fighter Louis “Da Last Samurai” Smolka. PXC 37 will be broadcast nation-wide on AKTV via IBC-13 to millions of viewers in the Philippines, and will stream online via PXC’s Facebook page. Visit www.pxc.com.ph or http://www.facebook.com/pxcmma for news and information. It was a sweet victory for Kyle Aguon as he avenged his 2008 loss by defeating Trevin Jones via unanimous decision last night in PXC 36 at UOG Field House, Guam. With that win over Jones, Aguon might just put himself as the no. 1 contender for Crisanto Pitpitunge’s title. Although the PXC officials are still on the process of choosing who will be Crisanto’s next foe, we will likely see either Aguon or Michinori Tanaka challenge Pitpitunge in May at PXC 37 in the Philippines as Tanaka, once again, impressed the PXC fans when he defeated top prospect from Reign Training Center, Caleb Vallotton via second round submission (triangle choke). Also, Josh Calvo lived up to the hype as he demolished Johnavan Vistante by way of first round submission (RNC). With that impressive win over Vistante, Calvo just sent out a message to all fighters in his division that he is a force to be reckoned with. I would love to see him fight Zebaztian Kadestam or Bellator fighter, Ryan Ford, who has been showing his interest on fighting inside the PXC cage and said that he wants to make his debut in May at PXC 37 against Ryan Bigler. Trevin Jones has been one of Guam’s top Bantamweights for the last 2 years, with only 1 loss by decision to PXC’s former Champ, Justin Cruz, over that span. 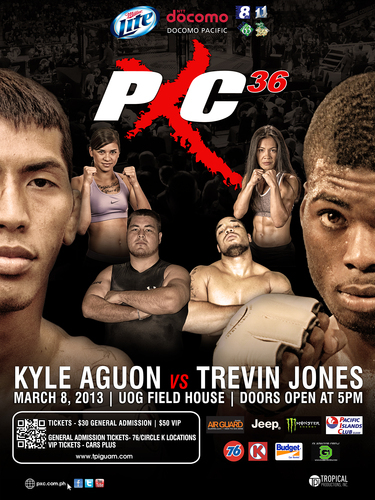 In PXC-36’s Main Event, Jones will be tested by another up and coming Spike-22 fighter, Kyle Aguon, who many feel has the potential to become Guam’s top contender for the Bantamweight Title. Jones versus Aguon shouldn’t dissapoint, as both fighters are well-rounded and have what it takes to go the distance. The Pacific Xtreme Combat-36 fight card is stacked with fighters from around the world gathering under one roof to throw down. 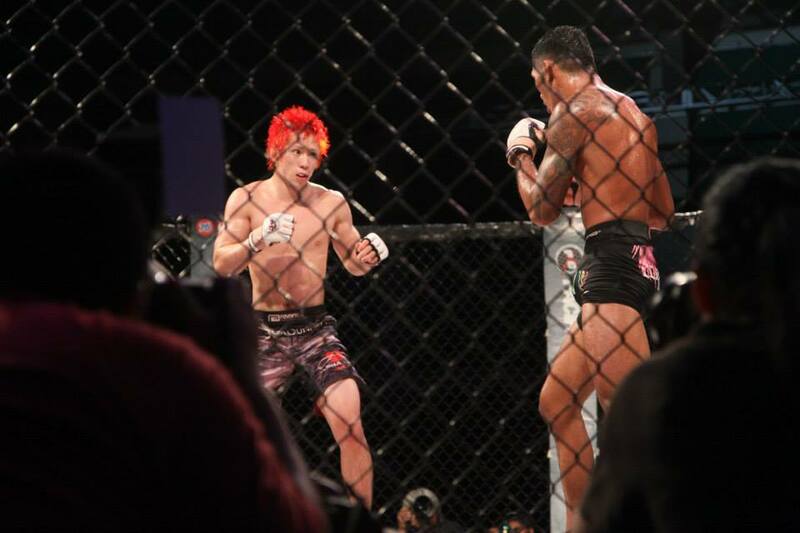 Guam has been hosting the best Mixed Martial Arts events in the region for over a decade, and for a Main Event bout, PXC didn’t have to go scouring the world to find two fighters who will put on an exciting show. PXC found what they were looking for at the island’s 2 top MMA gyms, as Spike-22’s Kyle Agoun takes on Trevin Jones from Underworld X-treme in the Rivalry Match. Spike 22 and Underworld Xtreme have the reputations of producing some of the best fighters in the region and have had a strong rivalry for years. Jones and Agoun are training partners with former rivals, Joe Taimanglo and Alex Castro, who put on great fights for PXC fans throughout their careers. Any time these two gyms match up in the PXC cage, it is sure to bring fireworks. Fighting out of Spike 22, Kyle Agoun is mentored by Melchor Manibusan and has a professional record of 4-3. Manibusan is one of Guam’s pioneering mixed martial artists and now veteran coach. Wrestling being the strongest part of his game Kyle is sure to display some great takedowns. According to Agoun, “I took off from work for my last hard weeks of training to focus more on the fight. Training two a days six times a week. Strength and conditioning mornings and MMA in the evenings. As a freestyle striker and fighter, I am focusing on every aspect of the game sharpening up all my skills for the fight.” Although Agoun has not changed any aspects of his fighting in preparation for the fight he also recently took his training camp to Washington to get a feel of different sparring partners. Aguon trained with new PXC fighter and cousin Josh Calvo, training at combat sport and fitness with Jeff Houghland and Foster in Brazillian Jui Jitsu. “This card features the best up and coming MMA fighters in Guam, Saipan, Hawaii, Japan and Korea. Look out for new PXC fighters making their debut, including Josh Calvo and Toby Misech from BJ Penn’s camp in Hawaii.” Said Eli Monge, PXC VP & Head-Matchmaker.